This is an exceptional piece from the Fieldings Crown Devon factory, manufactured in the 1930s. Redolent of the era which appreciated the lustre ware effect overlaying scenes of animals, birds or fairy-like figures, this vase is a beauty. It is an early 20th. 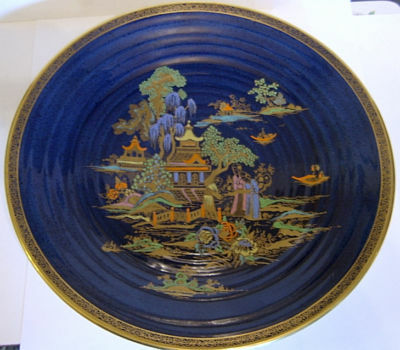 century large Lustre Charger using the very popular 'Mikado' design so beloved of Carlton Ware. Given that the decorator moved from Carlton to Crown Devon, it is no surprise that these styles of decoration overlap. Enamelled scenes are outlined in gold, depicting pagodas, bridges, oriental figures and punt-like boats. It measures just under 12 inches (30 cms) in diameter. It has three holes on the back to enable suitable hanging of the charger. It is backstamped appropriately showing Crown Devon, Fieldings. There is an impressed number but it is too indistinct to read. It is in excellent condition. It has no chips/nibbles nor restoration work.